The Model 900 (center) was in 1990 the largest computer in IBM's new ES/9000 family of processors. 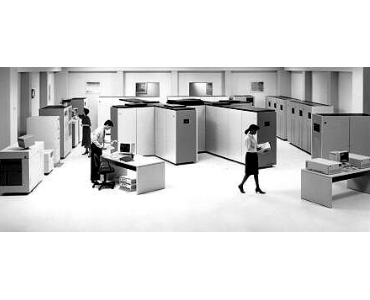 This water-cooled six-way multiprocessor provided up to 9 gigabytes (billion characters) of central and expanded storage -- double the processor storage capacity available on the ES/3090 Model 600J, the largest processor in IBM's earlier 3090 family. Commercial performance of the Model 900 was 1.7 to 1.9 times that of the Model 600J. The Model 900 also offered customers up to 256 parallel or Enterprise Systems Connection (ESCON) Architecture fiber optic vector facilities. With six vector facilities, the Model 900 was two to 2.8 times faster in numerically intensive supercomputing applications than a six-vector ES/3090 Model 600J.